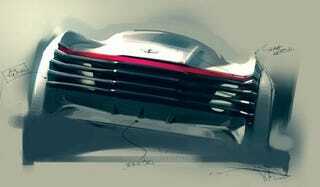 18 students at London's Royal College of Art (RCA) were tasked with designing a concept of the future of VW's bi-winged "B"-emblazoned brand. The result? A shave as close as a Cylon blade. More Bentley-badged future visions below. Eighteen Vehicle Design Course Masters students spent the past few months studying the work of Bentley's leading designers, including Head of Exterior Design Raul Pires who played a key role designing the new Bentley flagship — the Mulsanne. Drawing on Bentley's design heritage, they sought to develop a range of striking and futuristic car designs. Now four of the RCA students have been shortlisted to refine their designs with Pires and his colleagues with a winner and runner-up both being invited to join the Crewe-based company for a six month secondment in the Bentley design studio. What do we think of their visions of the future?